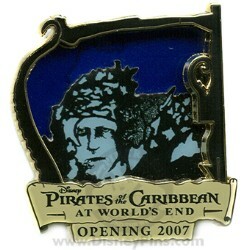 Countdown to the opening of Disney's Pirates of the Caribbean - At World's End with this Limited Edition pin. This pin features an illustration of Boot Strap Bill Turner as a pin on pin. Be sure to collect all seven (7) pins in the countdown series.